Work on the Ayia Napa Marina started on Tuesday, when Finance Minister Harris Georgiades initiated the ground-breaking ceremony in the presence of the Egyptian businessman who invested in the project. The ceremony was held in the presence of the Ministers of Health, Transport, the mayors of the region, and other officials. Ayia Napa Mayor Yiannis Karousos presented the Egyptian businessman, Naguib Onsi Sawiris, with the key to the city Sigma reported. The agreement with the company that took on the work for the first phase was signed at the beginning of the month. The first phase of work is set to include the port work and structure work. The project is estimated to be complete in three years. A second phase of work is expected to start on construction projects after the first phase, in which structures including two towers, homes, and commercial buildings will be built. The whole project is expected to be completed within five years of its start date and the investment is expected to reach approximately 220 million euros. Estimations, Sigma reported, have shown that approximately 800 new jobs are expected to be created for the construction, while another 200 positions will be created for the functioning and management of the project. 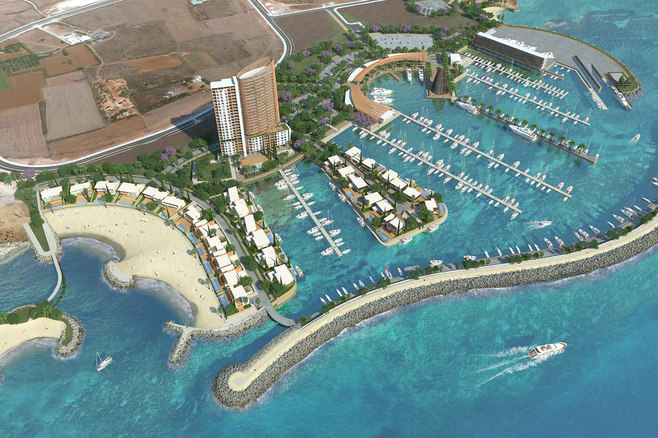 The Marina is planned to hold up to 600 ships, while the commercial and personal property developments are expected to be approximately 30,000 square metres.